These images shows the spiral structure of the coherent OAM light emitted from a beam of electrons accelerated to nearly the speed of light and arranged into a helix by a simple laser. Left: An intensity map. Note the dark center where the light cancels itself out, resulting in a cross section resembling a doughnut. Right: A phase structure map, clearly showing the helix described by the light. Credit: Hemsing, et al. (Phys.org) —Scientists at SLAC have found a new method to create coherent beams of twisted light – light that spirals around a central axis as it travels. It has the potential to generate twisted light in shorter pulses, higher intensities and a much wider range of wavelengths, including X-rays, than is currently possible. Until now, researchers created twisted light by shooting laser beams through masks or holographic gratings. 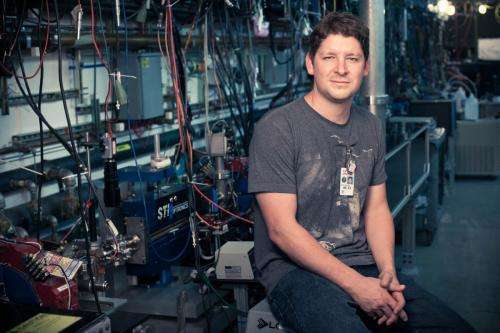 But a team of accelerator physicists from SLAC and UCLA has shown they can create it with a beam of electrons, in much the same way SLAC's Linac Coherent Light Source (LCLS) X-ray laser uses electrons to generate pulses of X-ray laser light. "There are lots of other ways to make OAM light," said Hemsing, "but most don't translate to X-rays." The experiments were carried out at the Next Linear Collider Test Accelerator (NLCTA), SLAC's small test accelerator. Although the OAM light the team coaxed out of their experimental setup was in the visible range, Hemsing said there's no reason the same technique can't be used to create OAM light of much shorter wavelengths, and thus much higher energies – X-ray energies. The experiment is only one of several being conducted at NLCTA to create "beams by design," or light with specific properties, by controlling the electrons that generate it, said Tor Raubenheimer, a professor of particle physics and astrophysics at SLAC and Stanford, who works closely with the NLCTA researchers. "Erik is one of the young star physicists down at the NLCTA," he said, "and has been part of a very productive physics program that is supported by both the Department of Energy Offices of Basic Energy Science and High Energy Physics." The research is a continuation of work done in photon science facilities, from synchrotron light sources like SLAC's Stanford Synchrotron Radiation Lightsource to free-electron lasers like the LCLS, where scientists have learned how to control and shape the electron bunches used to generate light. At the most advanced facilities, such as the LCLS, bunches of accelerated electrons are sent through undulators – exquisitely tuned series of magnets that force the electrons to wiggle back and forth in such a way they generate laser light. The combination of laser pulse and undulator imprints an energy pattern on the electrons. As they pass through another grouping of magnets called a chicane, the electrons reposition themselves like race cars on a curve, and hit the next straightaway arranged in the shape of a corkscrew. This "helically microbunched" arrangement of electrons then enters a second undulator that causes them to wiggle and emit spiraling light. Intense beams of spiraling X-ray light could open the door to new condensed matter research, said Hemsing. But there is one challenge to overcome: As with the development of the first X-ray lasers, technology is ahead of demand. Researchers who could take advantage of the special properties of OAM light don't necessarily know it's available or what it could do for them. But the success of LCLS should make things easier, showing the potential for working with new forms of light. "People can see how well the LCLS works," said Hemsing. "Now they're interested in what other kinds of light we can make."